While Gravity Rush remains a niche franchise, it still received a considerable number of crossovers with other franchises. Below you can find an overview of all the other games franchises that received Gravity Rush-themed DLC or a special Gravity Rush related event. If I missed any, let me know! A costume pack featuring Kat, Raven, Yunica and Alias was released for LittleBigPlanet 2 and LittleBigPlanet PS Vita on November 20, 2012. Support for LittleBigPlanet Karting was added later on. The costumes can also be used in LittleBigPlanet 3, as the game was made fully backwards compatible with the older games. Aside from a pack containing all the costumes, the costumes can also be bought individually. You can view some screenshots and a gameplay video by EpicLBPTime below. Kat (together with Dusty) was one of the playable characters in PlayStation All-Stars Battle Royale, a crossover fighting game similar to Nintendo’s Super Smash Bros. series. She became available as DLC on February 12, 2013 along with Starhawk‘s Emmet Graves, her in-game rival. Kat also received her own story mode, even featuring a bit of dialogue with Gade. Her Sea Kat costume and a Raven minion are unlockables in the game, while other minions (including Syd and Yunica) can be purchased as DLC from the PlayStation Store. You can view the announcement trailer and The Gameplay Dudes’ walkthrough of the story mode below. Playstation All Stars Battle Royale – DLC: Kat Story Mode Walkthrough!! Kat was made available as a DLC guest character for Hot Shots Golf: World Invitational on March 19, 2013. In the game she’s ranked as an “Expert” character. You can view the Japanese announcement trailer for her character below. Back in 2013, GungHo Online Entertainment’s Ragnarok Odyssey Ace included costumes, cards, and other items from the original Gravity Rush. Aside from a Kat and Alias costume for the player’s character, special cards were included which enhance aerial maneuverability and improve the efficiency of the Dainsleif mode. The DLC was made available at the same time as the game’s PS Vita release on August 29, 2013. You can view the original Japanese announcement video below. Alias and Kat’s character models as seen in Ragnarok Odyssey Ace. From April 3rd to May 7th 2014, the Japanese free-to-play mobile game Destiny of Spirits made Kat, Raven and Yunica available as characters that can be summoned as spirits. One of the game’s hidden bosses was designed by illustrated by Gravity Rush’s designer Shunsuke Saito. Republique, a story-driven stealth action game developed by Camouflaj and published by GungHo Online Entertainment, included an exclusive costume in the game’s PS4 version. The Kat-inspired outfit was made possible through a collaboration with Sony Computer Entertainment. The game’s PS4 version was released on March 22nd, 2016. UPDATE: Phoenix Wong on Twitter alerted me to the fact that the DLC was time-limited. Players could only download the DLC for free for a limited time as a single DLC pack available from the game’s launch day (March 22) through April 4. Apparently, the DLC was afterwards removed and can no longer be acquired. The Kat-inspired costume in Republique, an exclusive item for the game’s PS4 version. The crossover wasn’t just limited to new items for PSO2, as Gravity Rush 2 also received a “PSO2 Crazy Kitten” costume for Kat, based on the costume of the same name in PSO2. Also included with the DLC were PSO2 containers and Rappy photo items. The Phantasy Star Online 2 DLC for Gravity Rush 2 was released on February 7, 2017 in the US and the EU, after previously being released in Japan. What makes this all the more remarkable is the fact that Phantasy Star Online 2 itself was never released there, despite a localization being announced back in 2012. Officially, that localized version still hasn’t been canceled. The Crazy Kitten costume for Kat in Gravity Rush 2. The Crazy Kitten costume and the PSO2 container and Rappy photo items included with the DLC. 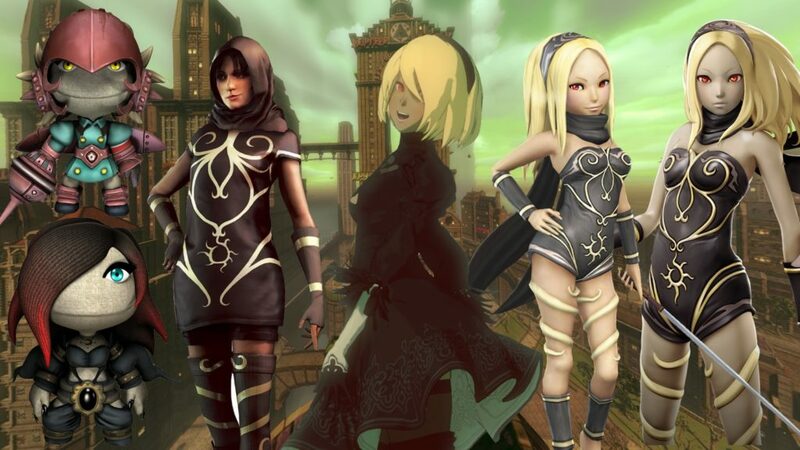 Arguably the most well-known crossover for Gravity Rush 2 in the West was the inclusion of NieR: Automata‘s 2B costume in Gravity Rush 2. The free DLC allows Kat to wear 2 versions of 2B’s costume, one with and one without visor. The DLC was made available on May 4, 2017 in the US and EU, shortly after its release in Japan. GungHo Online Entertainment ‘s Let it Die is the most recent game to receive a crossover event with Gravity Rush 2, and it’s actually still on-going at the time of writing. As part of the event, the “Kat Collab Armor Pack” (a 3 piece armor set which looks like Kat’s default “Shifter 2.0” outfit in Gravity Rush 2), is available for a limited time on the PlayStation Store from 8/10/2017 through 9/6/2017. A number of Skill Decals and quests are also available in the game as part of the crossover. Closeup of the Kat costume in Let it Die. The Kat costume in Let it Die. One of the Gravity Rush decals in Let it Die. Previous PostGravity Rush Remastered on PlayStation Now: A Viable Way to Play the Game? It’s great to see a game like gravity rush having several crossovers with other franchises, i hope we get to see a third entry with more crossovers, as i think, in one way or another, could help people know about the franchise. 2B’s costumes in GR2 are my favourite – I would love to see NieR: Automata do the same with Kat’s Shifter Outfit. A Kat costume, “Gravity Girl”, also appeared as free DLC for Japan Studio’s Soul Sacrifice Delta. Thanks, I’ll update the article! What name should I use to give you credit for the information?